Iowa’s offense had struggled in the first half, outside of Joe Wieskamp knocking down four threes on four attempts, the Iowa offense had been pretty quiet. 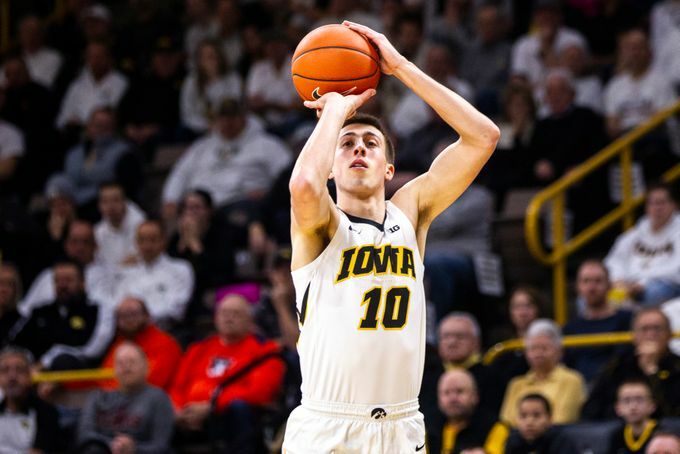 The Hawkeyes held for the final shot where Connor McCaffery found Isaiah Moss wide open for a three, which Moss nailed as the buzzer sounded on the first half. For the next three minutes of game play, the Hawkeyes nailed SIX three pointers and took their lead from 43-31 to 58-42. Isaiah Moss buried four threes in the second half, five in all as he finished with 21 points on 7-of-12 shooting from the field, but was not the leading scorer. Once again “Big Game” Joe Wieskamp came out fast and furious, much to the delight of the 13,589 in Carver-Hawkeye Arena on Sunday. The freshman from Muscatine had 24 points, 5 rebounds and 3 assists and was perfect..literally, shooting 8-for-8 from the field and knocking down two out of two free throws. “When that first shot went down, it gave me a lot of confidence” Wieskamp said of his performance. “The guys were finding me open shots, got me going early, and it just kept me going throughout the game”. Wieskamp said his performance reminded him a bit of his 54-point performance against Bettendorf his senior year at Muscatine. Tyler Cook also made his return from injury on Sunday as he sat out in Iowa’s win at Penn State on January 16th. 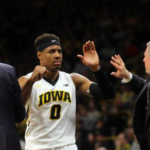 “He’s not 100%, but he’s close” said Iowa head coach Fran McCaffery. “I thought he had some explosion, especially on that dunk in the first half, but you’ll see him play better and feel better”. Luka Garza also continued his streak of impressive play, finishing with 20 points, 2 rebounds and 2 assists as he has now scored more 16 or more points in the last 3 games and in a stretch where Iowa has needed it due to injuries. As for Illinois, the Illini managed to keep it close in the first half, but the barrage to start the second half was far too much for the young squad from Champaign to handle. “That’s being taken out to the woodshed and being whooped today” Illini head coach Brad Underwood stated. Other notable performances include Jordan Bohannon adding 10 points, as prior to the game he was honored for scoring his 1,000th career point on a free throw against Ohio State on January 12th. Connor McCaffery also added in a season high 8 assists and was crucial in moving the ball. The Hawkeyes next game will be on Thursday against #7 Michigan State, who is now standing alone as the leader of the Big Ten after Michigan’s loss to Wisconsin on Saturday.